Have you learned how to make Christmas recipes for gifts? Many of these that once were considered very good and important to make for the holidays have fallen out of circulation over the years. When we hear these foods once celebrated foods, most of the time we don’t even recognize them. For instance, in the following poem written in the 1800’s “Twas the Night before Christmas”, did you ever wonder what sugar plums are? When you were learning how to make Christmas recipes for gifts maybe you didn’t think of sugar plums belonging to these like you would think of maybe cranberry recipes. Some think that this poem is referring to the actual sugar plum fruit which resembles a large purple grape. I, for one, cannot consider having visions of a fruit (no matter how good) in my head as I sleep. Some say the sugar plum recipe originally was a piece of coriander coated in sugar and later turned into a fruit candy recipe. Knowing how scarce sugar was back in this time period, I can ponder the idea of the children being so excited and dreaming about this sweet confection which they only get on this day. As you learn how to make Christmas recipes for gifts you may realize that your famly had its own recipe for sugar plums. My modern sugar plum recipe is below for you to try. Pick up some new small produce baskets from your grocery store and fill with the sugar plums. After wrapping in pretty Christmas decorations, these make nice homemade food gifts. Chop cherries, dates, apricots and almonds very fine and combine in a large bowl. Add the marshmallows, orange zest and graham cracker crumbs. Toss to blend well. Add enough honey just to moisten mixture so it sticks together. Shape into plum size ovals and roll in the powdered sugar. All Christmas recipes are not edible, but still are good to make for homemade Christmas gifts. 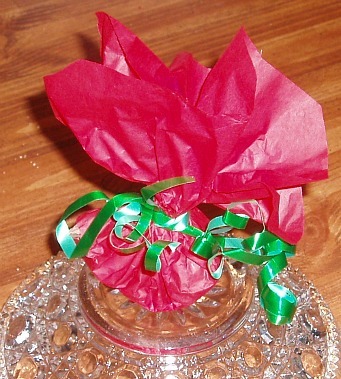 The following Christmas potpourri recipe will send Merry Christmas greetings to your friends and family members who prefer a natural air freshener over ones with added chemicals. 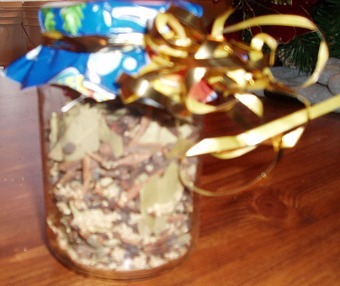 A small bag of this fragrant mixture with a potpourri burner will make a most welcome gift. The scented oils are readily available at craft stores. Be sure to add a little note card as to the use. Happy holiday cooking! Combine all ingredients in a bowl except for the oil. Toss to blend and then sprinkle the oil over the top. Toss again to blend with the oil. Store in an airtight container. This is not to be eaten. To use potpourri mix, add 2 to 3 tablespoons of mix to a potpourri burner or a small saucepan of boiling water over very low heat. Keep adding water so it does not go dry. Mix in large punch bowl and serve immediately. Combine mustard, garlic, rosemary and pepper; rub mustard over leg of lamb. NOTE: Lamb can now be refrigerated for up to 24 hours if desired. Place roast on meat rack in shallow pan; insert meat thermometer in thickest part of roast. Roast in hot oven 15 minutes; reduce temperature to 325F degrees and roast 20 minutes per pound or until temperature reaches 150F degrees for medium. Some Christmas recipes like this can be packed in jars, decorated and given as holiday gift recipes. Remove large outer leaves of cauliflower; break into flowerets; set aside. Combine water, vinegar, honey, mustard seeds, celery seeds and peppercorns in non aluminum pot. Bring mixture to a boil, reduce heat and simmer for 30 minutes. Remove foam from surface; add carrots. Bring mixture to a boil, reduce heat and simmer 3 minutes. Add cauliflower and celery; bring to a boil and simmer 5 minutes. Add pepper strips and green beans; simmer 3 minutes. Spoon vegetable mixture into 8 glass pint jars. Pour hot vinegar liquid over vegetables, evenly distributing the spices. Add 1 clove garlic, 1 hot pepper and 1/8 teaspoon salt to each jar; let cool. Seal jars and refrigerate for 1 week to distribute flavor. 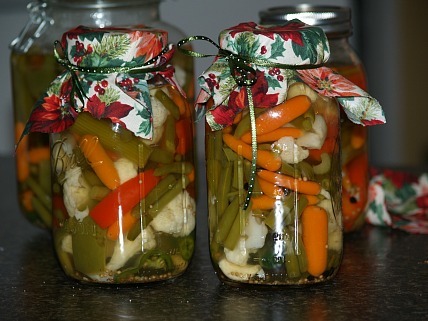 NOTE: These need to be kept in refrigerator; if giving as a gift enclose a card saying: STORE PICKLED VEGETABLES IN REFRIGERATOR FOR UP TO 3 WEEKS. This Christmas recipe shaped like a pretty Christmas tree is a nice appetizer when entertaining or given as a gift. Combine and mix cream cheese, Havarti cheese, basil, lemon peel and garlic powder. Shape cheese mixture in a cone shape like a tree; roll in chopped parsley until covered. Cut a star for the top of tree from lemon peel; cover and refrigerate 2 hours.